As an eight year old orphan, my grandfather, Adrian P. (“A.P.”) Bardet,immigrated to the United States from France in 1903. Arriving in San Francisco to be raised by his aunt, grandpa graduated from a technical high school, served a 4-year journeyman machinist apprenticeship, and thereafter worked at a reputable “iron works” in the City, building and overhauling industrial machinery for the gold and silver mines still operating in the California foothills of the Sierra Nevada Mountains and in Nevada. At 25 years of age, A.P. 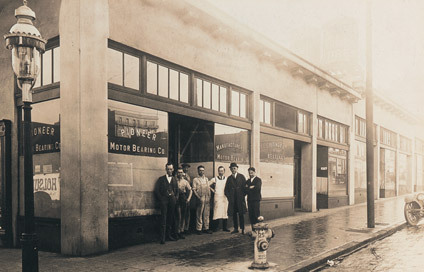 Bardet founded Pioneer Motor Bearing Company in San Francisco in 1920 with a few partners he would soon buy out. The “motor” in our company’s name evokes our formation at the height of the American Industrial Revolution and the emergence by then of the new and fast-growing automotive market. Our company name reminds us of our deep roots, when automobiles were commonly called “motor cars”. Back then, Pioneer manufactured new bearings primarily for auto parts stores and independent garages, serving these customers, and dealerships too, with a rapid response bearing repair service. Long before the term was popularized, from the day we opened our doors Pioneer was devoted to “customer service”. Grandpa and his team had to be in order to survive our first nine years and then the Great Depression. From automobile dealerships and independent garages throughout northern California, they received at the Greyhound bus station in the morning damaged bearings to be repaired. They rushed them to the shop, performed necessary repairs and returned them on an outgoing bus that evening, routinely providing one-day turn-around service. Although these days it is impossible to provide a same-day repair service for large bearings weighing up to 10,000 pounds, today the legacy of rapidly responding to our customers’ requirements is the core of our company’s culture. During World War II, when the San Francisco Bay Area was a major center for the U.S. Navy, Pioneer grew necessary capacity to meet the demands of the regional hyperactive marine and industrial markets. The Japanese attack on the U.S. Navy at Pearl Harbor, Hawaii, in 1941 interrupted the college education of my father, William P. (“Bill”) Bardet. But by 1947 he had returned to Stanford University, earned his B.S. degree in Industrial Engineering and joined Pioneer. Dad still comes into work today, using e-mail to communicate his cogent suggestions in his effort to contribute to our continuous incremental improvement. I believe he has been in the babbitt bearing industry longer than any other living person in North America. Dad’s lasting achievements were leading Pioneer out of the automotive market and into the industrial, marine and power generation markets we continue to serve to this day, while at the same time establishing a professional in-house engineering capability for the company. In 1956, because of our expanding capabilities and growing demand for industrial and marine bearings, Pioneer became a qualified supplier to Western Gear Corp. and the marine divisions of Westinghouse Electric and General Electric. Then in 1958, Pioneer moved from San Francisco to a larger manufacturing plant we built in the City of South San Francisco. By 1960, Pioneer completed its withdrawal from the automotive industry to focus its energies on marine, industrial, and power generation markets. At the same time, we adopted as standard procedure the use of in-process and final ultrasonic testing of the integrity of babbitt bonds to bearing shells, with in-house personnel appropriately trained and certified by independent authorities. During this period, Dad hired good machinists who became the “next generation” of Pioneer’s leading skilled craftsmen, many of whom stayed with the company for 30 or more years. Among them, leaders arose, including Don Wengler, who served as Shop Foreman for years before becoming Western Technical Services Manager and one of the leading practical experts in the U.S. on the art and science of babbitting (who was called upon in the 1990’s to provide advice and consultation to ABB on site in Mannheim, Germany). Don was a member of the team that helped design, staff and equip our new North Carolina plant. The same week in 1965 that Don joined Pioneer, Dad hired Steve Bonino, who rose to become Production Manager at our South San Francisco plant, and who moved to North Carolina to head up our new operations there four months after we opened. Today Steve is our Vice President and Chief of Operations, with 45 years of experience with Pioneer and the manufacture and repair of bearings. Not long after Don and Steve were originally hired, Al Hayes joined Pioneer for a career of over 30 years, rising to become Production Manager and, with Don and Steve, one of the “pillars of the company”. In 1964, on a handshake, Dad formed what became a 27-year association with the Glacier Metal Company, Ltd., at the time Europe’s largest plain bearing manufacturer. After Pioneer initially served as a sales representative of the industrial and marine products of Glacier for a few years, Glacier created a wholly-owned U.S. subsidiary, The Glacier Metal Company, Inc., and appointed Dad to run it for more than two decades before Glacier imploded in restructuring and division after division was sold off or closed down. With Glacier as a mentor, Pioneer’s knowledge and understanding of fluid film bearing technology grew exponentially during the 1960’s and 1970’s. It was a time when tilting pad journal bearings were introduced on a large scale, computer technology arose to predict bearing operational performance, Glacier owned more than 50% of all world patents in existence on bearing materials and retained more than 50 bearing engineers in a central research, development and applications engineering center. Under Dad’s leadership, Pioneer established its own engineering department in 1966, appointing Leon (“Holly”) Hollingsworth the company’s chief engineer. Holly had enjoyed a long career at Western Gear Corp. and had a wealth of practical engineering experience. In the late 1960’s, Holly invented our Fluid Pivot® technology, and with the help of his assistant engineer, Drew Nelson (now a professor at Stanford), developed both our JC and JS Fluid Pivot design styles. By the early 1970’s, we introduced to the market our Fluid Pivot Tilting Pad Journal Bearing, with pads relying not on conventional mechanical pivots but operating on a self-generated hydrostatic film of oil in addition to the hydrodynamic film. Soon thereafter, Dad won our first OEM customers for the bearing: Solar Turbines; and Cooper Energy (now Rolls-Royce), both of which continue to purchase Fluid Pivot bearings to this day. In 1974, Pioneer’s penetration into the power generation industry got a boost when we became a qualified supplier of new babbitted bearings to the Power Generation Business Unit of Westinghouse Electric Corporation (now Siemens Energy). As for me, in the days when our public schools offered good industrial arts programs, I took almost 4 years of high school metal shop courses. I applied some of my embryonic knowledge by working on the shop floor for Pioneer during a summer or two in high school and college, scraping a few parts along the way. After graduating in 1972 from Stanford University with a degree in Political Science with an emphasis on European and American history, I stopped out of school for two years to work at Pioneer before going on to law school. We became the first bearing company in North America to be designated by an OEM as a licensee and OEM-authorized bearing service facility. After receiving my J.D. degree in 1978, I joined and later became a partner of a law firm in San Mateo County, just south of San Francisco. At the same time, Dave Jochner joined the company to serve as Sales Manager. With a good technical background, Dave helped introduce both Pioneer and Glacier products and services to customers throughout the United States. Meanwhile, in 1986, I met Walt Truelson, a San Francisco management consultant, who in one morning meeting inspired me to see opportunities to grow Pioneer. That same day I decided to leave the practice of law and join the family business. I’ve never looked back. My timing was fortuitous. 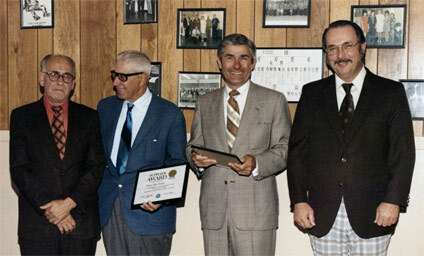 My dad had laid the groundwork for the next level of business development in our history. In 1989, The Power Generation Business Unit (“PGBU”) of Westinghouse Electric Corp. appointed Pioneer its exclusive supplier for 5 years of all new Westinghouse-designed babbitted bearings. 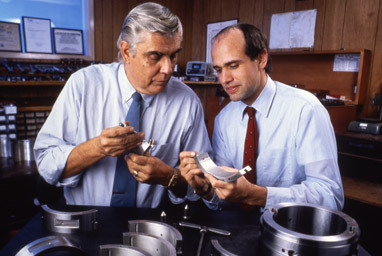 At the same time, in 1989, after more than 30 years of repairing Westinghouse bearings, we became the first bearing company in North America to be designated by an OEM as a licensee and OEM-authorized bearing service facility when PGBU of Westinghouse Electric granted Pioneer an exclusive bearing repair licensee. Events were moving fast, for in the same year we acquired land in Cleveland County, near Charlotte, in North Carolina, in the Southeastern United States, built a new plant and opened our facility in July, 1990. Our building was specially designed to facilitate the efficient manufacture and repair of large babbitted journal and thrust bearing assemblies. And so Pioneer entered a new era, with plants on each coast of North America. And once again, it was our good fortune to attract and retain so many good people to grow the company in North Carolina. Initially, David Wesson, Bob Swisher, Marcia Hord and Chuck Reasinger were the nucleus of the local team who worked with Lloyd Pask, who transferred from our California plant to serve as Shop Foreman. They are the team that started it all for us in Cleveland County. They are the original pioneers. Steve Bonino joined them before the end of our first year. Years later, after the closure of our California plant in 2000, they all would be joined by Ralph Martinez, who had served as a Shop Foreman for us in South San Francisco. Today, with more than 32 years of experience with Pioneer, Ralph’s continues to serve as Production Manager, the most challenging job in the company. Meanwhile, the rapid success of the Westinghouse-Pioneer bearing repair license relationship attracted the attention of another multinational OEM. In October 1993, ABB Power Generation, Inc. appointed Pioneer Motor Bearing its exclusive bearing repair licensee, authorized by ABB to perform bearing repair services directly for its customers in North America using its OEM drawings and specifications. Today we are the exclusive bearing repair licensee of Alstom Power, successor in interest to ABB. And we continue to serve both Siemens Energy and Alstom Power by manufacturing new bearings, often to meet tight delivery demands of their customers. In the 1990’s I set about to reposition Pioneer in an increasingly fragmented bearing industry in which OEMs were laying off engineers, reducing costs and focusing on their core technologies while outsourcing more parts and technical requirements. In the shadow of the retirement of Leon Hollingsworth and his successors several years before, I wanted to resurrect the engineering department and provide customers with first-rate intellectual assets: market-leading professional custom bearing engineering design, development and technical services. In 1996, Lyle Branagan joined Pioneer as Engineering Manager and, as they say, “the rest is history.” Three years later we began to thrust our way deeper into the hydroelectric industry when Fred Wiesinger joined Pioneer to serve as Technical Services Manager. These two distinguished engineers have earned the respect of end users, OEMs and the Electric Power Research Institute (“EPRI”), and are frequent lecturers at EPRI user group meetings. In 2000, recognizing the difficulty of hiring young machinists in an area with some of the country’s highest housing prices, I closed our California plant and transferred many of our assets to North Carolina. A few years later, we constructed a substantial addition to our offices and added a third machining bay to our manufacturing plant. On February 15, 2005, we entered into a comprehensive alliance with Michell Bearings of Newcastle, U.K. (a member of the Rolls-Royce Group). Michell is acknowledged as a premier supplier of self-contained babbitt (whitemetal) and polytetraflouroethylene-faced (“PTFE”) hydrodynamic thrust and journal bearings for large hydroelectric vertical turbine-generators and a wide range of marine and industrial applications worldwide. Most recently, within the past year or so, I was surprised but delighted that both my sons, Adrian and Jeremy, joined Pioneer after college and good work experience elsewhere and hit the ground running, making immediate contributions to our marketing and sales departments. As we begin to envision the 4th generation of the family eventually managing and growing the business, I think A.P. would be proud that his great-grandsons learned from their father and grandfather years before joining the company what it takes to sustain a business so long. In short, speaking for the next generation, Pioneer will continue to operate ethically and seek good, fair, and mutually beneficial long term relationships with employees, suppliers, consultants, alliance partners and customers. At the end of the day, our history is not about bearings. It’s about people. It’s about treating our employees right so that all of us at Pioneer can serve our customers effectively as a spirited, experienced team. On behalf of all of the Bardet family, I thank everyone for helping us sustain and grow Pioneer Motor Bearing Company for 90 years.